St. Lucia Airport Transfers | UVF & SLU Shuttle & Private Taxi Options | Through our on-call Chauffeur service we can pick you up at any location throughout the island. Our private transportation division St. Lucia Airport Shuttle provides you with a quick and hassle-free way to get to and from St. Lucia airports both Vieux-Fort, UVF, Hewanorra International Airport Castries, SLU, George F. L. Charles Airport (formerly Vigie Airport). ​We ensure the safest, easiest, most economical and most reliable ways for you to travel between the airport and your hotel or any other destination on the island. 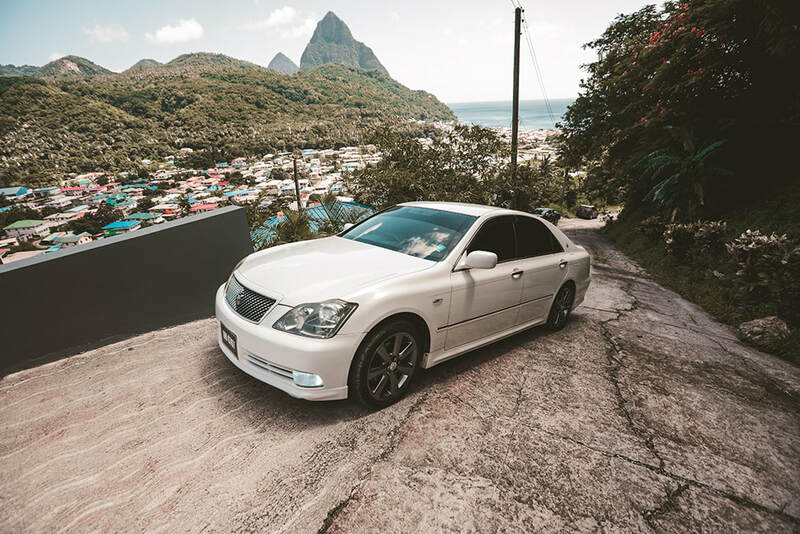 ​We take pride in providing service excellence and, judging from the reviews we get on travel websites like TripAdvisor, our St. Lucia airport transfers are a cut above the rest. While the comfort of all our clients is important, those who want to travel in extra style for a special occasion may want to choose our St. Lucia airport executive or other VIP packages. We cater for everyone, whether you’re a business traveler or are on vacation with your family. Why choose our pre-booked St. Lucia Airport Transfer? Arriving in a new destination or trying to make it to the airport in time for your departure flight is always a little stressful, no matter how you make that journey. However, when you pre-book transportation from St. Lucia with us, you’re assured of a much more stress-free trip. One of our friendly drivers will await you when you arrive at either Hewanorra International Airport UVF or George F.L. Charles Airport SLU. This saves you the trouble of having to queue for a more expensive St. Lucia taxi Service. Since we keep track of arriving flights, we’ll know if your flight is going to arrive early or has been delayed. We then adjust our schedule accordingly so that you never have to wait or worry that we won’t be there anymore once your flight touches down. We also plan carefully ahead so that you’ll make your departure flight on time too. We only use vehicles of the highest standard so that your journey is as comfortable as possible. All the fleet vehicles are kept impeccably clean and well maintained. They’re regularly serviced to minimize the risk of breakdowns and they’re properly insured to provide for any contingency. Vehicles come with air-conditioning, which is essential for keeping you cool in the tropical heat of our island. We provide the vehicle most suited to your needs, whether it’s a high-roof minibus for larger groups or a luxury sedan with state-of-the-art mobile office technology for business travelers. Our executive packages also include a choice of beverages and reading matter for the journey. ​​We have the largest network of drivers on the island so that there will always be one available for you, no matter what time of the day or night you need St. Lucia airport transport. All our drivers have the necessary licenses and are carefully selected to provide the best possible service. They are courteous and helpful and will be happy to try and fulfill any special request you might have, whether it’s some cold water to drink or whether you want to make a quick detour along the way. Pre-booking with us is incredibly simple. Use our online booking form to get a quote or confirm your booking and we’ll reply within an hour. If you prefer, you can also phone us and speak directly to one of our friendly and efficient staff members. We accept all major credit cards and cash and you pay us upon arrival at your destination. ​St. Lucia has two airports. You’ll most likely arrive at the larger and busier UVF Airport St. Lucia, better known as Hewanorra International Airport, located at Vieux Fort in the south of the island. The smaller SLU Airport St. Lucia, also known as George F.L. Charles Airport, is located at Castries, our capital in the northern part of the island. Most international passenger flights arrive and depart from UVF but charter flights and flights to some of our Caribbean island neighbors use SLU instead. When you pre-book with us, your driver will meet you at the relevant airport, holding a sign with your name on it so that it will be easy for you to identify him or her. The driver will then help you with your luggage and have you on your way to your destination in the blink of an eye. ​Since all our drivers are local St. Lucians who love their island home, they’re very knowledgeable about good places to eat, fun things to do and special events you may want to check out, from sports to culture. They will be happy to act as tour guide during the trip and tell you more about St. Lucia’s history, geography and special attractions so that you can enjoy your stay to the full. ​When your stay is coming to an end, you can pre-book your departure transfer in the same way that you booked the transfer for your arrival. Alternatively, when you arrive in St. Lucia, simply speak to your driver about arranging a departure transfer as well and he or she will give you the contact information you’ll need to confirm our booking. Another option is to book a round-trip transfer right from the start. If your plans for departure change, you only need to let us know ahead of time and we’ll make the necessary adjustments to our schedule. If you have any queries, you may find the answers in our FAQ section or by reading the comments from our many satisfied clients. You can also simply contact us directly. ​The useful map will give you an idea of St. Lucia destinations and the main routes we use. Remember, though, that we will take you anywhere on the island, any time, day or night.